After a few days in Lassen Volcanic National Park, we headed towards Redwoods National Park. I needed to pick up a prescription for Kellisa at a Walgreens in Redding, CA. There was a delay in getting the prescription, so we spent a day swimming at a hotel and running errands. 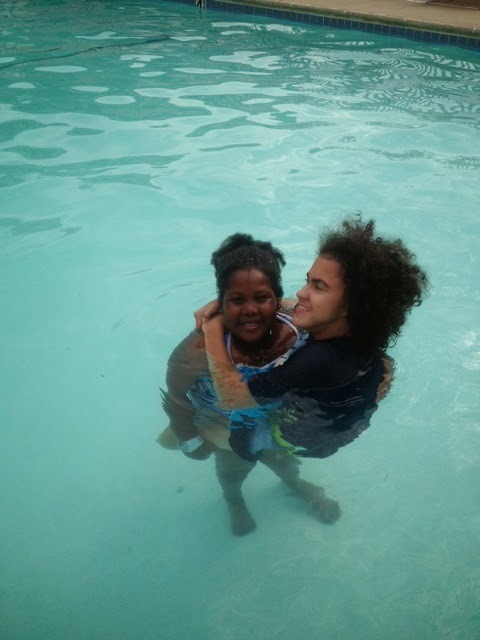 Laurel wanted to help Kellisa in the pool and they had a great time together. I needed to get a few items from Walgreens, so we went into the store to pick up the prescription. Laurel wanted to look at some little girl make-up that was on an end cap. I was looking at something with Kellisa just around the corner from Laurel. We were less than five feet away, but Laurel was out of my eyesight. I heard security paged over the speaker in the store to conduct a sweep of the store. I immediately looked around the corner to check on Laurel and she was standing there looking at the make-up. I was disturbed to also see a man less than three feet away from Laurel just looking at her. When we made eye contact, he turned to fumble on a shelf like he was looking at something other than Laurel. Laurel was not happy when I grabbed her without a reason and made her leave the aisle. I don't know what a molester looks like, but if I had to describe one...it would be this guy exactly. I kept both girls close the rest of the time in the store and I noticed this guy always hanging somewhat close to us and it never seemed like he had a purpose. I let Laurel get some lip gloss to make up for me grabbing her and we paid for everything at the pharmacy. As we were leaving the store, we saw the man in the checkout line and he was only purchasing four of the largest containers of Vaseline. With the disabled card, we were parked right by the door and I quickly loaded the kids and we were off before the man left the Walgreens. I'll never know if he was up to something or if it was just a series of coincidences. From then on, I made sure to keep both girls in my sights. It wasn't always easy since Kellisa likes to wheel off on her own and Laurel likes to assert more and more independence every day.